GM ended the quarter with $14 billion in cash. Pictured is its headquarters in Detroit. General Motors, battered by a global economic collapse and buoyed by U.S. rescue loans, posted its sixth straight quarterly loss and burned through $5.2 billion in cash as revenue shrank by more than a third. The net loss of $9.6 billion in the fourth quarter compares with a loss of $1.5 billion a year earlier. The operating loss was $5.9 billion. GM said it expects its auditors to cast doubt on the company's ability to survive as a "going concern." The loss sealed CEO Rick Wagoner's fourth straight year without a profit and reflects the distress that GM showed last week when it asked the U.S. Treasury Department for as much as $16.6 billion in additional government aid. GM, which has received $13.4 billion so far, said the request signaled a market that was deteriorating more rapidly than anticipated. Today's results reinforce “the notion that GM will need multi-billion dollar government assistance to continue as a going concern,” said Efraim Levy, a Standard & Poor's analyst, in a note to investors. GM ended the year with $14 billion in cash, including its initial installment of $4 billion in U.S. loans. Revenue in the fourth quarter fell 34.2 percent to $30.8 billion. The $30.9 billion net loss for the year was the second-highest in GM's 100-year history. Chief Financial Officer Ray Young said the rate of GM's cash burn accelerated in the fourth quarter because the global downturn was worse than GM anticipated. He called the $5.2 billion drain "fairly sizable." Declining auto demand, especially in previously healthy developing economies, pushed GM to reduce production late in the quarter. "When you make production cuts in December, you lose the revenue but you still have supplier payments," Young said in a conference call today. He said GM will reduce the cash burn of 2009 below the amount consumed in 2008. The burn rate will be steepest in the early months. In GM's last earnings report in early November, the company said it was close to exhausting its cash supply after burning through $4.8 billion in the third quarter. The automaker then petitioned Congress for help, was rejected by the Senate and bailed out by lame-duck President George W. Bush. 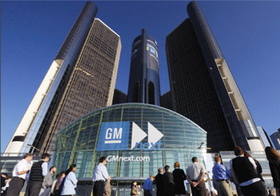 GM's fate now rests with a task force appointed by President Barack Obama, who told Congress this week that the Detroit 3's ills were largely self-inflicted as he pledged to help create an industry that "can compete and win." GM lost money in each of its four regions last quarter. North America had the steepest deficit with an adjusted net loss before taxes of $2.1 billion, almost double the year-earlier total. Using that same basis, GM Europe lost $956 million, more than four times as much as in the fourth quarter of 2007. The unadjusted European loss was $1.89 billion. The adjusted figure was $879 million in the GM Asia Pacific region and $154 million in Latin America, Africa and the Middle East. A year ago, both regions were profitable. Last week, the auditing firm Grant Thornton said such notices may be common as automakers file their annual reports.